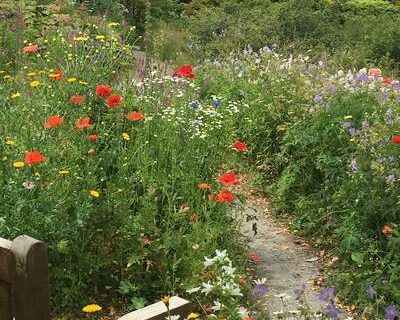 July is the traditional time to enjoy wild flower meadows, so I’m sneaking two plants in that combine to create a meadow feel, whatever the space available in your garden. I’m imagining them above longer grass at lawn edges, under and through hedges, or tickling around in borders to soften more formal planting schemes. The first is an ox-eye daisy, or Leucanthemum vulgare to give it the horticultural name. I just counted twenty seven synonyms for this daisy, which shows me it’s been in cottage gardens and wild flower meadows for centuries. My favourite alternate name is ‘moon daisy’ as the white petals really do show up in moonlight. It’s a perennial that’s easy to grow in any average soil. It loves full sunshine, but will be happy if it gets a few hours a day. Cut the stems back after flowering (or seeding) to keep it tidy. It’s very tolerant and you don’t have to fuss with it. Just avoid planting it where it will sit in wet over winter. To propogate let it seed about the place. It’s not invasive so pull up seedlings you don’t want. The ox-eye daisy pairs beautifully with another common meadow and verge flower, the Silene dioica; best known as Red Campion. I think the campion is under-rated as we get used to seeing it without looking at it. It’s easy to grow in any decent garden soil, forming low clumps that are easily divided in the autumn. It flowers between May and September,and gets up towards thigh high, so it’s great for wafting through. The small, open flowers are an intense pink on narrow stems; they mingle well with grasses. I enjoy them in our cottage garden and meadow as the summer sun sets behind them and makes them glow. Both these plants will bring a touch of the wild to any garden. I love the link they make between formal gardens and the natural landscape of Dartmoor just over the wall.